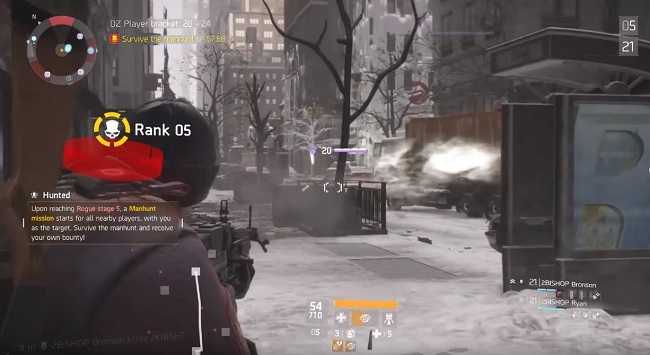 The Dark Zone is a combined arena where high level PvE enemies and PvP players are mixed together. One feature that's unique to this area is called the Rogue status which signifies a players neutrality and also serves as a bounty system for other players to earn rewards for killing a rogue agent. 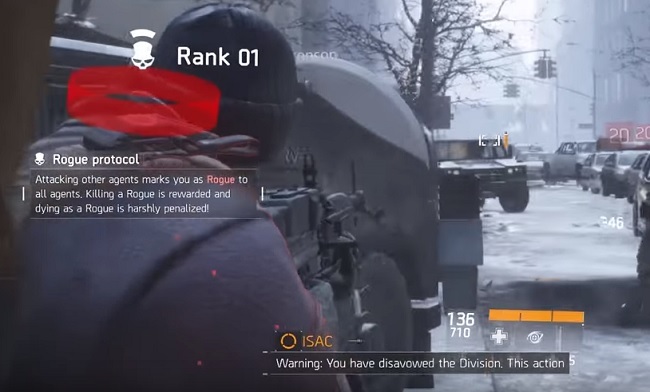 Essentially you go Rogue (i.e get the Rogue Status) as soon as you kill another agent (PvP player) in the Dark Zone. Wounding another player isn't enough: you must kill the player to signify a Rogue kill - at which point the opponent drops their loot for you to steal and they're forced to choose a new respawn point.. Upon killing the first agent you'll get a white skull with a red circle above your head. This skull stays in place for a brief time and then disappears so long as you aren't killed yourself and as long as you don't kill anyone else either. Killing additional agents will increase your Rogue rank, which after killing several agents will turn from red to a permanent yellow icon, signifying that you're now Rogue Rank 5. At this point a 5 minute countdown timer appears in the top of the screen and you are now at the highest Rogue level. Rank 5 has it's own pro's and con's. As soon as you hit this level a Manhunt quest will trigger for all nearby players with you as the target. Thankfully reaching rank 5 also gives you (as the Rogue) the chance to earn a potential bounty yourself - so long as you survive the manhunt. When the skulls icon is white/red, other players are only alerted to your presence when they're in close proximity to you (limited radius). This detection radius increases as your Rogue rank increases i.e. as you kill more agents and by the time the icon turns yellow the detection radius is far greater. This makes it much easier for other agents to find you should you choose to kill multiple agents. In order to lose the Rogue status you must survive for a certain period of time - determined by the Rogue rank that you're at. This can range from about 90 seconds to several minutes. At the "yellow" Rogue status point you must wait the full 5 minutes before you are a neutral agent again. During this 5 minute period other players will try and hunt you down because for their benefit they can earn high rewards for doing so. You MUST avoid the temptation to kill more agents otherwise your countdown will reset. Hiding places, safe houses and other hard to reach areas provide the best chance of survival and thus loosing your Rogue status. It's worth noting that going Rogue comes with huge risks. If you die you will lose a substantial amount of DZ XP, money and access keys. At Rank 5 you have the most to lose - around half or three-quarters of a rank in some cases and a sizeable chunk of credits (money) from your account. 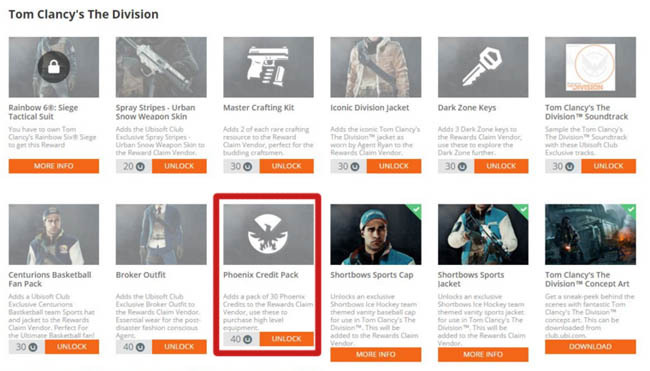 Whilst murdering other agents is a great way to steal loot, you've got to survive the bounty period if you want to keep that loot, during which time you're gambling with your already established rank and credits. 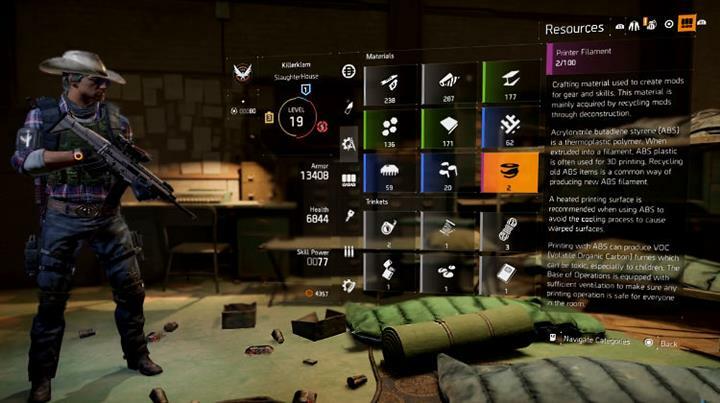 There's also the extraction process for safely claiming that stolen loot - this makes the DZ an intense but high reward area that exemplifies teamwork.